Are you on the comfy train yet or what? Seriously how can fashion and style be so comfortable and chic all at the same time? Heaven. Are you wearing Palazzo's? Would you? Someone called me a hippie yesterday at work. It's OK I grew up in a small country town with red necks and hippies and I consider myself a little bit of both ;] Ha! Have an outstanding day!!!! It's almost the holiday weekend! Wooooo!!! those pants!!!!!!!!!!!! LOVE! and i love ur hair like this! Love this! You are rocking this look. I love the headband and that heart necklace is so pretty! I love the pants, and I love your hair like this! Do you just use a regular curling iron? 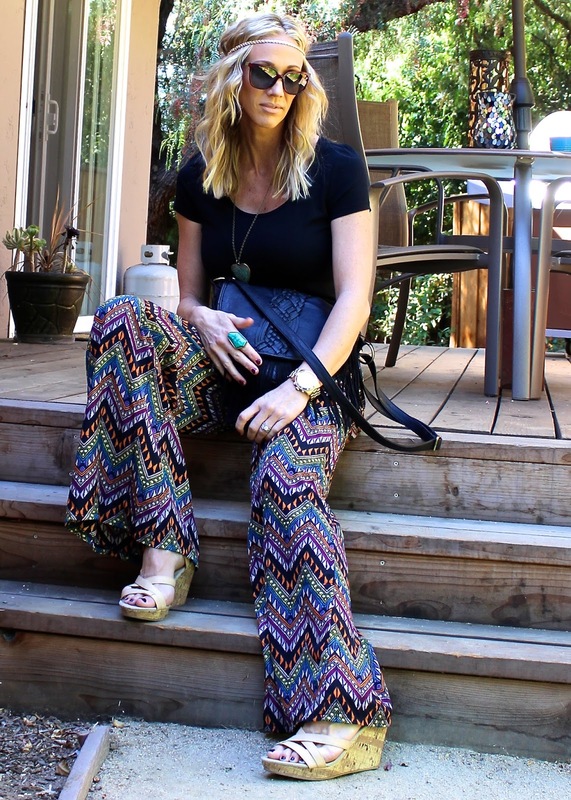 I'm lovin palazzo pants!! I also love the hammer pants too! Gonna have to get me some!! Lookin good! Great outfit, I love the pants I'm always unsure on whether i could pull something that bold off but this post has definitely inspired me to try! The pants are so cool. You look great! love those pants, so cute!!! happy I stumbled across your blog, look forward to reading more!